LUCAMA, N.C. – Lee Pulliam looked like he was on his way to a second consecutive Thanksgiving Classic victory at Southern National Motorsports Park on Sunday evening, but a late race caution set up a wild sequence of events which ended with Tommy Lemons Jr. in victory lane. Pulliam had dominated the late stages of the event, but was held up behind a lapped car which allowed Justin Johnson to go to his outside for the lead. Johnson spun on the exit of turn four, bringing out a caution. On the first green-white-checkered restart, Lemons got a jump on Pulliam, then Pulliam wrecked off the front bumper of Matt McCall. When the dust settled, Lemons held on for the win. “We definitely had a really good car in the first half,” Lemons said. “Just a little tight in the second half. Stuck around long enough. Luck wasn’t on our side last weekend, luck was on our side this weekend. Kind of bittersweet from last week but it’s an awesome way to cap the year with a win here. Brenden Queen, who had been involved in an incident earlier in the race, mounted a late race charge to finish second. McCall held on to finish third. 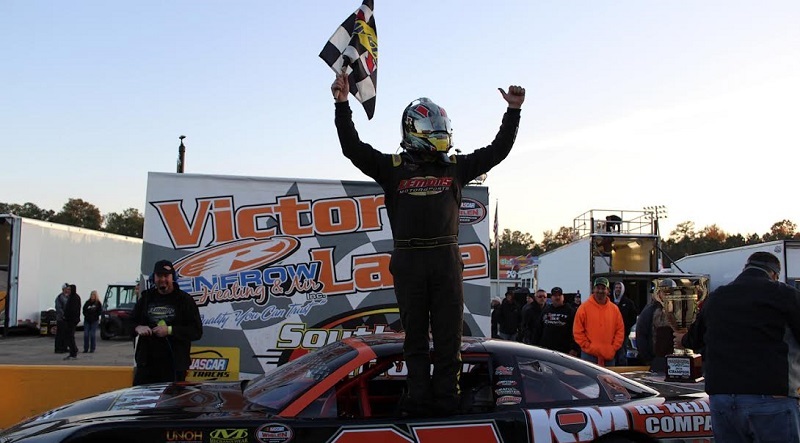 The incident with Pulliam, however, brought back memories from the 2011 Late Model Stock Car race when McCall spun off Pulliam’s bumper on the last lap of the race – which Pulliam went on to win. McCall insisted the contact with Pulliam was not payback.